This project uses Magnetic Rolls and Rustic Birch Wood Sheets. It’s perfect for display on a chalkboard, other magnetic surface or it can be displayed in a 6×6 frame. Supplies: Magnetic Roll, Rustic Brich Wood Sheet, Heart Pattern, Red Grid Pattern Paper, Red Polka Dot Pattern Paper, 1/2-inch Red Ribbon, Heart Punch (various sizes), Old Book Paper, Letters Die, Die Cutting Machine (Big Shot was used here), Paper Trimmer, Adhesive and Foam Dimensionals. 1. Trim a piece of old book paper and magnetic roll to 6×6. Set aside both. 2. Next, download your free copy of the heart pattern we used. 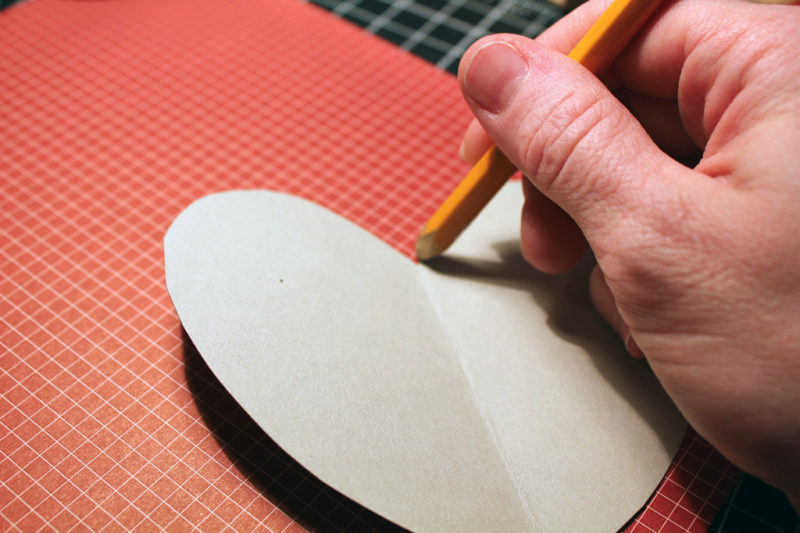 Print and cut out, then trace onto a sheet of red grid pattern paper and cut out. 3. Using a sheet of Rustic Birch , cut the letters ‘L’, ‘O’, ”V’, and ‘E’ with the letters die and die cutting machine. Peel backing from letters and adhere to front of red grid pattern paper heart, stacking the ‘L’ and ‘O’ directly over the ‘V’ and ‘E’. 4. 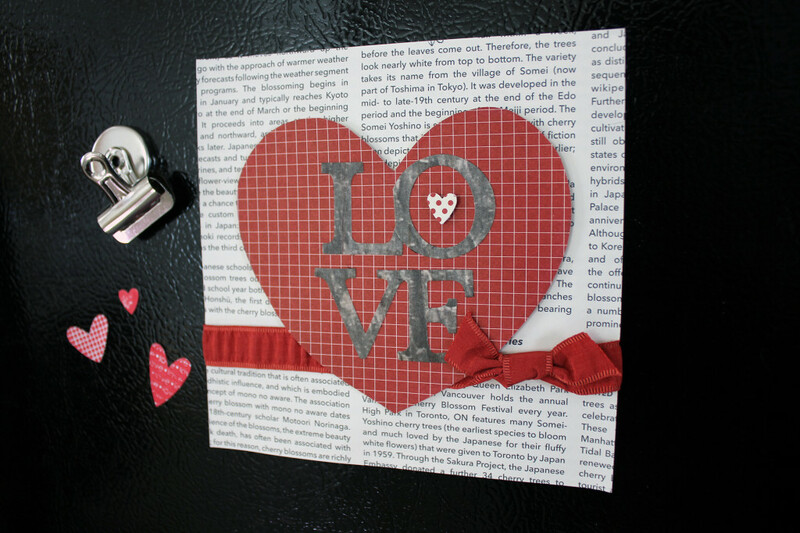 Using a mini heart punch, punch one heart from the red polka dot pattern paper. Adhere to the center of the ‘O’ with a foam dimensional. 5. Trim a piece of 1/2-inch red ribbon to approximately 15-inches in length. Wrap around the ribbon around the paper, approximately 1 1/-2 inches from the bottom of the sheet. Fasten with a knot and trim ends at an angle. 6. Adhere red grid pattern paper heart to the center of the 6×6 old book paper piece, over the top of the ribbon. 7. Next, adhere old book paper to paper side of 6×6 magnetic piece. This entry was posted in DIY Projects, Free Downloads, Home Decor, New Seasonal & Special Occasions and tagged birch, Birch Wood, Birch Wood paper, crafts, diy, et cetera, Home Decor, Rustic, stationery, Valentines.